On the hunt for poutine while downtown is no easy feat. You would think it would be a quick fix given the number of clubs and bars around the area. If you think about it, the number of intoxicated people craving some greasy gravy covered fries must be huge! Especially during the weekend. Having had a few drinks at my apartment, a couple of friends and I set out our sights on La Belle Province on Peel just below Sherbrooke to sate our late night craving. Making our way through the drunk/happy/obnoxious St Patrick’s day revelers by sidestepping a few street brawls, ducking a couple of flying projectiles and dodging unpredictably stumbly party-goers, we finally made it around 1:45 am. To our disappointment, it was closed! How could this be?! On St. Patrick’s day too, with so many people out and about, La Belle Pro would have been busier than ever! We didn’t understand it. Not ready to give up just yet, we made the trip to the next closest Belle Pro on Mackay, which also happened to be closed… forever! The windows were covered in brown paper and the place just looked totally shuttered. So sad. It’s been there as long as I can remember. And they had this cool vintage diner aesthetic going on. I guess that just means there’s a little less competition for the soon to be opened Smoke’s Poutine in the Faubourg. At a loss, we scrambled for the next best alternative. We had to have poutine. Not eating at least one bite of that delicious, cheesy stuff was not an option. I’m sure many readers can relate to the desperate determination that I’m talking about. When you gotta have it, you gotta have it. Angela’s, the Italian pizzeria on Maisonneuve was suggested, as was Moe’s Deli. We ended up going to Angela’s mainly because of its proximity to our location. Moe’s was a few other blocks down and it seemed like a couple people in our group weren’t going to make it. Yes, it was that bad. So we settled on going to Angela’s. The poutine here is different, to say the least. The cheese used in the original and the smoked meat poutines are not your traditional Quebec squeaky cheese curds. Instead, the fries are topped with a generous portion of mozzarella that melts over and oozes into the middle and lower layers of fries. Much of the gravy has already been absorbed into the fries, so there’s not much liquid left at the bottom if you like that extra salty taste. We all really enjoyed the cheesiness of the dishes but I have to say that they weren’t exactly what we were looking for. The fries had a texture that wasn’t unbearable (on the dry side) but wasn’t the greatest either. 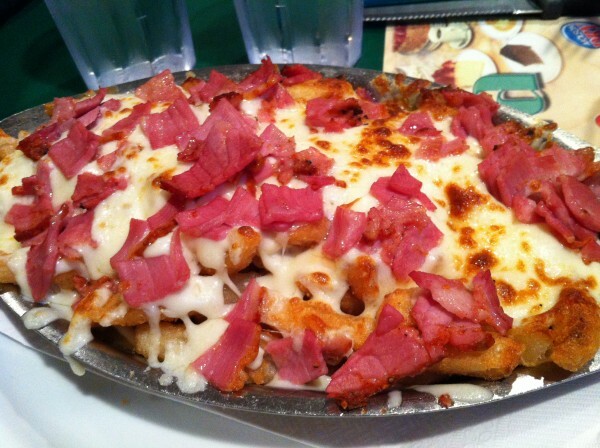 The smoked meat poutine was constructed in exactly the same way as the original just with a couple of thinly sliced smoked meat pieces sprinkled on top. This place will do if you have no other option. It also helps that they’re open from 11 am to 6 am. On a positive note, I have heard that the pizzas here are pretty good… But next time I’m fiending for poutine, I’ll hold my breath and wait until I’m within a reasonable distance to La Banquise. It goes without question that in the realm of poutine in Montreal, La Banquise reigns supreme. 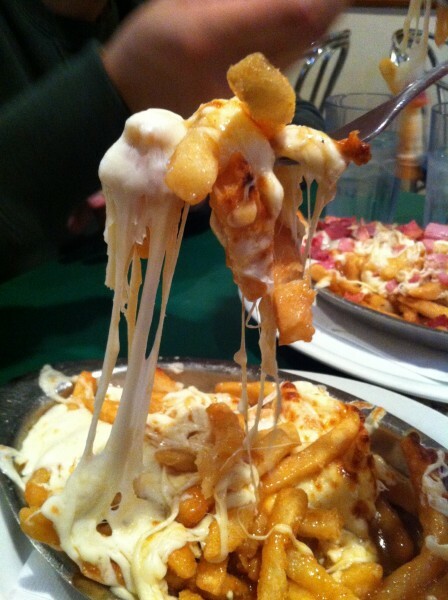 Tags: Angela's, Dinner, forkandtell, Fries, Gravy, Italian, Late Night Snack, Maisonneuve, Montreal, Mozzarella, Poutine, Smoked Meat. You need to try Dunn's Smoked meat poutine! I totally understand the Poutine deterination, I always said One day I want to start visting all the deli's and so on for the hunt of the perfect poutine! You would think that in a place like montreal that would be a gives, that you would know exactly where to go for that! I must say I haven't found it yet, but I know its out there…waiting!